The terms “healthy” and “Mexican food” don’t often go together. Mexican food is often seen as greasy and filling while healthy dishes tend to be lighter and, let’s face it, boring. But what if we told you that it’s possible to create delectable Mexican dishes that won’t make you feel guilty? Keep reading to learn more about our delicious recipes and remember, if you need the best and freshest ingredients, choose Productos Real! Not only are bell peppers colorful and beautiful, but they’re also delicious and lightweight as well! Stuff your peppers with meats or low-carb options and serve with sliced lime for a perfect, crunchy treat. Since these treats are large, you’ll feel happy and full once you clear your plate. A big issue with weight loss and healthy diets boils down to the consumption of excess flour so many people avoid Mexican food since most of it comes with flour tortillas. 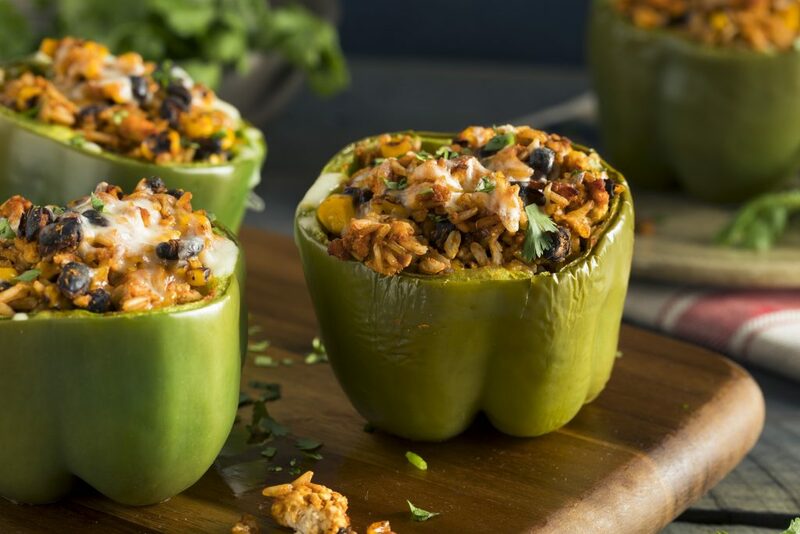 By using bell peppers as the vessels for your delicious Mexican food, you won’t have to worry about consuming too much flour! You can also replace tortillas with lettuce wraps for a fresh, healthy bocadito. Although tortillas may be a bit “dangerous” when it comes to dieting, it’s still possible to eat them every once in a while. Consider grilling some delicious shrimp tacos this summer. Add guacamole, some lettuce and a bit of salsa for that tasty kick and you’ve got yourself a great summertime dish! Nothing brings you back to the beach quite like fresh seafood and grilled shrimp just scream Cancun beach cookout. You can replicate this dish in the comfort of your own backyard. Crack open a (light) Mexican beer and kick back as you relax and eat this delicious dish! It’s possible to make a delicious dish that’s both healthy and filling. What’s important is what you put into the dish itself. For this recipe, choose chicken and white beans instead of brisket and you’ll have a tasty treat that has all the flavor and none of the guilt. Also, add a delectable green chile sauce to tie it all together. Go ahead, snap a pic and post it to Instagram. Your compadres need to see the incredible dish you’re about to indulge in. If you’re starting to feel a bit hungry, then visit Productos Real! We have all the freshest ingredients so you can make your healthy Mexican dinner.